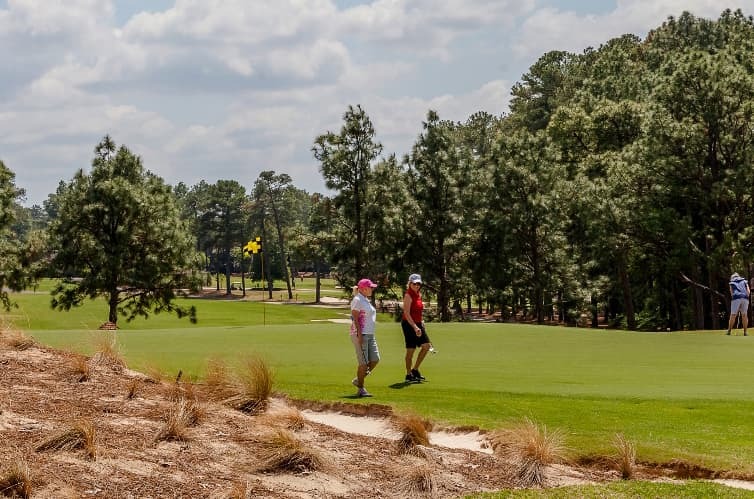 PINEHURST, North Carolina – In recent Pinehurst history, the 17th hole of Pinehurst No. 2 has played a pivotal part in identifying its newest champion. On Sunday in the 1999 U.S. Open, Payne Stewart made his birdie putt moments after Phil Mickelson missed his, giving Stewart a critical one-shot edge heading to the 18th tee. At the 2005 U.S. Open, Tiger Woods’ Sunday charge was officially stalled after a bogey preceded a clutch birdie by Michael Campbell – more on Campbell later – at 17. And in the 2014 U.S. Women’s Open, Michelle Wie essentially clinched her first major championship by holing a slick putt that rode the ridge down the spine of 17’s treacherous green. None of those shots, though, might’ve been better than William Nottingham’s in the championship match of the 117th North & South Amateur on Friday. Moments after sinking a perilous 8-foot par putt on 16 to halve the hole right after opponent James Anstiss had made his own 9-footer for par, Nottingham arched a high 6 iron against the darkening sky and watched as the ball settled softly on the green and slid just inches by the cup, coming at rest 4 feet above the hole. While Anstiss himself hit a nice tee shot to about 12 feet – reminiscent of Mickelson’s answer to Stewart – Anstiss couldn’t will his sidewinding attempt to fall. Nottingham, though, managed to nestle his putt into the hole, taking his first lead of the match. A brief rain delay and a bit of a mess of the 18th hole later, No. 2’s 17th again proved to be the difference as Nottingham, of Kingsport, Tennessee, rallied from 2-down at the turn to beat Anstiss, of New Zealand, 1 up. Nottingham battled his driver throughout the championship match, but managed to not only recover with crucial par putts, but also fight his way back into the match because of them. While Anstiss lost his lead by failing to get up and down at critical points, Nottingham made big par putt after big par putt, starting with a 10-footer on 9 that kept him 2 down, and culminating with the biggest one on 16. Nottingham credited a methodical alignment approach that he only recently went back to as making the difference on No. 2’s storied greens. As rain began to pour down after Nottingham’s birdie on 17, both players fanned their drives well to the right of the 18th fairway. Walking to their balls, tournament officials suspended play to wait out about a 15-minute downpour. Neither player had much of a shot into the 18th, though Anstiss managed to place his ball a few yards short of the green. Nottingham’s approached actually struck the lip of the bunker, but he found the middle of the green with his third shot. Anstiss made a nice pitch to about 4 feet above the cup on 18, and when Nottingham couldn’t connect from about 40 feet, Anstiss had a chance to send the match into extra holes with a par. But his putt slid by on the right edge, and Nottingham, a rising sophomore at Clemson, was the 117th North & South Champion. Anstiss, a native of New Zealand who spent much of his time in Pinehurst admiring the photographs and memorabilia of Campbell’s 2005 triumph in the clubhouse’s hall, received a call from the fellow Kiwi following the match. Campbell had been following the match on Twitter from Spain, hoping to add Anstiss to a Kiwi-Pinehurst connection that includes Danny Lee’s win at the 2008 U.S. Amateur. Anstiss was moved by the call.